The boys have been asking for their socks. I guess it is time they had a pair too. It really was tough to decide on the colorway from Scout. So many great ones to choose from. They changed their minds several times, but finally decided on this. Too perfect! I am hoping to get two pairs....420 yards.....maybe. A perfect beginning for Project Spectrum, don't you think? And for Libby, well that girl always knows what she wants. This was a custom order from Scout. I just told her pink/green/yellow, she likes "preppy" This is an absolute perfect colorway for the girl! Look how it even matches her bedroom! Thanks a gazillion Scout! 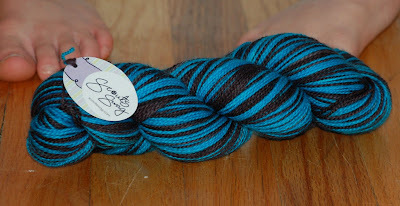 How about this yarn for next color triad in project spectrum! Knocking them all off with one project. It was -3 this morning and I thought there was a 2 hour delay. I had the kids bundled waiting inside the house for the bus which never came. Hmmm, called a friend, school was canceled! What? Oh....I wanted to sit and knit all day....I think I still might.......I have to cover those toes! 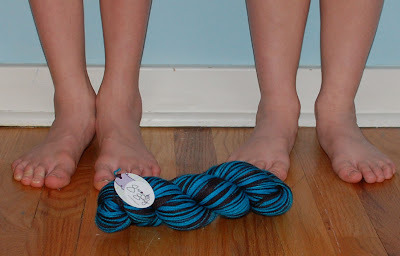 I love the photos with the feet & yes it is great for Project Sspectrum, I just picked up my yarn today for Project Spectrum. Your daughter has good taste, I really like those colors. Can't wait to see them all done. Those are going to be some very sweet toes, er socks! Love the girly colors! What great colorways! And I know that Scout's yarns are just AMAZING in real life....they look great in pics, but just don't do them enough justice! You are so welcome. I need to put that Prepster up in the gallery. I forgot to get a picture! Maybe you could get one for me? Great colors!! Especially the ones for you and your daughter. We are -16 this morning, I think we will be wearing 2 pairs of socks out today. those sweet little feet are going to be so happy because of you! have fun knitting them up. Oh Libby has great taste! And I think you'll safely get 2 pairs for the boys.